While posting an order to QuickBooks, If Unify is unable to find an item match in QuickBooks, then it will prompt you to create / map the item. 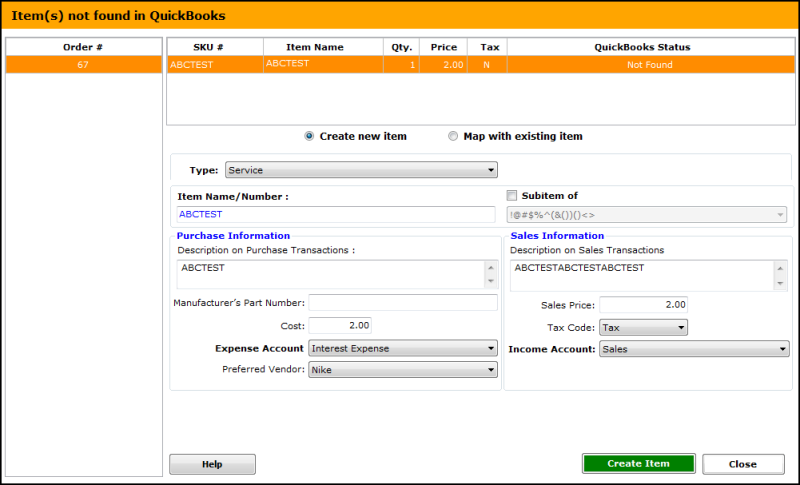 This option is available if you select "Prompt to create products in QuickBooks" under Configure Store >> Products. To create a new item, first select an order from the left. Unify will display a list of all items for this order along with a status indicating which item was not found. For an item not found, use the settings below to provide all the item details. The fields are pre-filled with information available for the item. WISH LIST: Automatically create the mapping when creating new item. Currently , have to create new item, then try to post again, which brings up the option to map to existing, which then has to be closed, before finally being able to post.